Looking for Myrtle Beach Area Real Estate? You are at the right place. "SC Real Estate Network" is the easiest site for home buyers and sellers in Horry and Georgetown Counties. 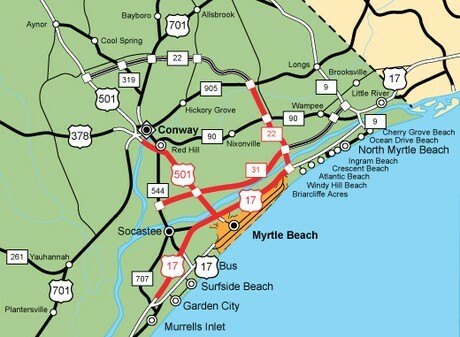 Search for homes, condos, land and more in Myrtle Beach, North Myrtle Beach, Little River, Conway, Garden City, Surfside Beach, Murrells Inlet, Pawley's Island, Loris, Longs, and Aynor. The sixty miles along the coast is called the Grand Strand and offers over 100 Golf Courses, 1700 Restaurants, Eight Live Entertainment Theaters, and tons of shopping at Barefoot Landing, Broadway at the Beach, Two Tanger Outlets and several malls. Excellence in healthcare, with award-winning medical centers. Lower taxes means a larger life. South Carolina does not tax social security benefits. Active Lifestyle, a warmer climate means more playtime. Cost of Living is Low, while the quality of life is high. Diversity in education; students have many exceptional opportunities from Kindergarten to Higher Education. Career opportunities - positions in hospitality, medical, education, retail, and more. Our real estate agents are all REALTORS, members of the National Association of Realtors, the SC Association of Realtors, the Coastal Carolina Association of Realtors, and members of the MLS (Multiple Listing Service). Thank you for choosing SC Real Estate Network as your door to Myrtle Beach Coastal Real Estate market.